News Flash! Check us out on WCAX TV! “A Strange Tale” first appeared on the front page of the weekly Montpelier Argus and Patriot on December 21, 1887. Hannah F. Stevens of Bridgewater cut the story out and pasted it in her scrapbook without noting the source. Her elderly son discovered the scrapbook and showed it to a Rutland newspaperman. The Rutland Herald reprinted the story on May 24, 1939 with a note that source was unknown. Four days later, the Boston Glob picked it up. In April 1940 Yankee Magazine published an account of the story. In 1943 The Old Farmer’s Almanac printed a version. Alton Hall Blackington repeated the story on the radio and in lectures. 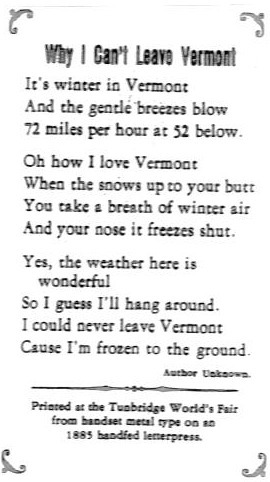 Charles Edward Crane included the story in his book, Winter in Vermont. In the 1949-50 issue of Vermont Life, Roland W. Robbins reported that by researching in the Vermont State Library he had found the original publication in the Argus and Patriot. However, he could not identify the author and asked the public to help. Two years later he discovered that A.M. was Allen Morse, a dairy farmer from Calais, who was born in 1835 and had died in 1917. His granddaughter, Mrs. Mable E. Hynes of Agawam, Massachusetts, remembers hearing him tell the story many times in her youth. He embellished the story more with each successive telling and the family called it “Grandpa’s yarn”. Mr. Morse wrote articles on agricultural and political topics for various periodicals, stories for the New England Homestead, and verse. He submitted “A Strange Tale” to the Argus Patriot as the request of his eldest daughter, Mrs. Haynes’ mother. She worked at the paper and arranged to have the story published on her Dad’s birthday. While the story did come from his imagination, it was probably inspired by events from his childhood when epidemics of typhoid and diphtheria were common. When this happened in the winter, the bodies had to be preserved in much the same way as in A Strange Tale until the ground became soft enough in the spring to bury them. The Argus patriot listed the author as A.M. noting the events took place in a mountain town some 20 miles from Montpelier. A.M. wrote that the tale was excerpted from his Uncle Williams’ diary. January 7: I went on the mountain today, and witnessed what to me was a horrible sight. It seems that the dwellers there who are unable, either form age or other reasons, to contribute to the support of their families, are disposed of in the Winter months in a manner that will shock the one who reads this diary, unless that persons lives in that vicinity. I will describe what I saw. Six persons, four men and two women, one of the men a cripple about thirty-years-old, the other five past the age of usefulness, lay on the earthy floor of the cabin drugged into insensibility, while members of their families were gathered about them in apparent indifference. In a short time the unconscious bodies were inspected by several old people, who said, “They are ready.” They were then stripped of all their clothing, except a single garment. Then the bodies were carried outside, and laid on logs exposed to the bitter cold mountain air, the operation having been delayed several days for suitable weather. It was night when the bodies were carried out, and the full moon occasionally obscured by flying clouds, shone on their upturned ghastly faces, and a horrible fascination kept me by the bodies as long as I could endure the severe cold. Soon the noses, ears and fingers began to turn white, then the limbs and face assumed a tallow look. I could stand the cold no longer, and went inside, where I found the friends in cheerful conversation. In about an hour I went out and looked at the bodies; they were fast freezing……I could not shut out the sight of those freezing bodies outside, neither could I bear to be in darkness, but I piled on the wood in the cavernous fireplace, and seated on a shingle block, passed the dreary night, terror-stricken by the horrible sights I had witnessed. January 8: ….”We shall want our men to plant our corn next spring,” said a youngish-looking woman, the wife of one of the frozen men, “and if you want to see them resuscitated you come here about the 10th of next May.”…. May 10:…The men commenced work at once, some shoveling away the snow and others tearing away the brush. Soon the box was visible. The cover was taken off, the layers of straw removed, and the foodies, frozen and apparently lifeless, lifted out and laid on the snow. Large troughs made of hemlock logs were placed near by, filled with tepid water, into which the bodies were separately placed, with the head slightly raised. Boiling water was then poured into the trough from kettles hung on poles near by, until the water in the trough was a hot as I could hold my hand in. Hemlock boughs had been put in the boiling water in such quantities that they had given the water the color of wine. After lying in this bath about an hour, color began to return to the bodies, when all hands began rubbing and chafing them. This continued about another hour, when a slight twitching of the muscles of ht face and limbs, followed by audible gasps, showed that life was not quenched, and that vitality was returning. Spirits were then given in small quantities, and allowed to trickle down their throats. Soon they could swallow, and more was given them, when their eyes opened, and they began to talk, and finally sat up in their bathtubs. They were then taken out and assisted to the house, where after a hearty dinner they seemed as well as ever, and in nowise injured, but rather refreshed, by their long sleep of four months. Truly, truth is stranger than fiction.